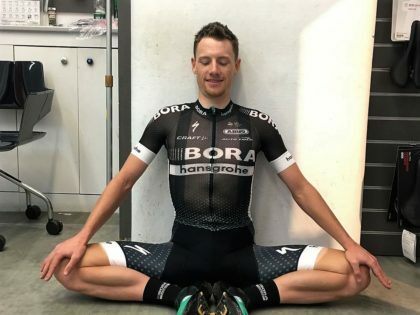 Rider habits and bike-fitting practice have evolved over time - are they now well aligned? Front-end drop to bars - back/neck/shoulder problems, saddle contact, knee/hip stability etc. All of these issues still have resonance of course. 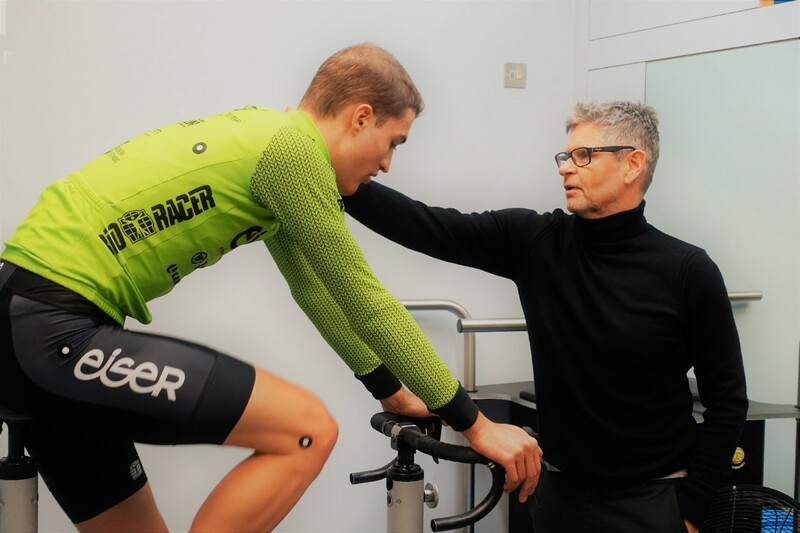 And all are generally resolved as we go through the current Cyclefit process. 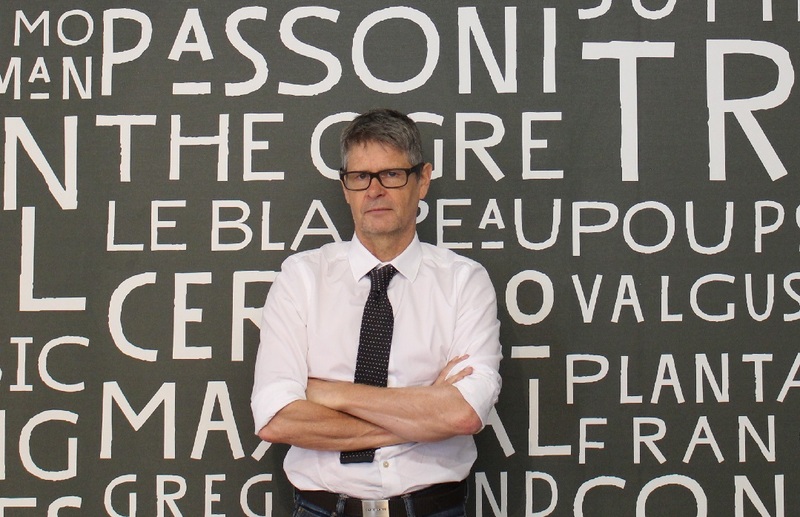 The issues we now routinely see in our studios are much more complex and nuanced than a twenty or even ten years ago. 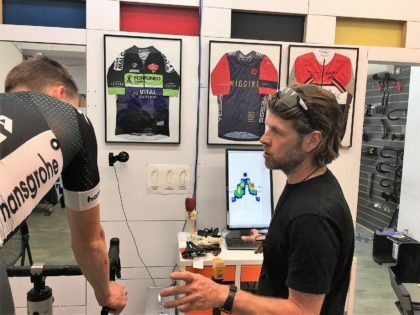 In part because there are many other companies offering bike-fitting now, so most of the elementary fit-related issues may have been resolved in a client's previous bike-fit. In that sense we are often 'fitters of last resort' for many people who have been referred for chronic bike-related pain or injury concerns. 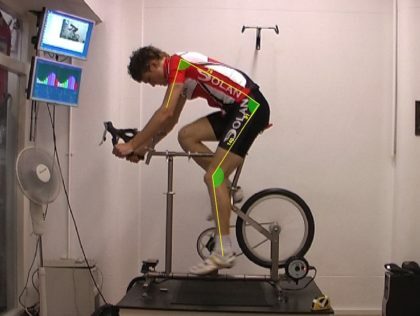 We now think that a bike-fit is a side-benefit of a Cyclefit, but rarely the primary intention anymore. Whisper it quietly but elementary bike-fitting is actually pretty easy. 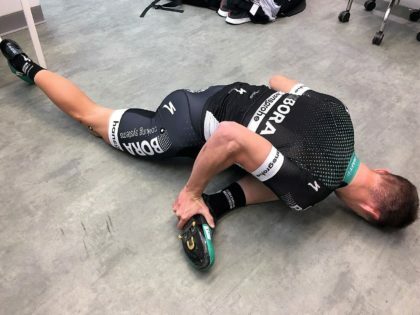 "Whisper it quietly but elementary side-plane bike-fitting is actually pretty easy"
1. New Indoor Generation. Watt Can Possibly Go Wrong? 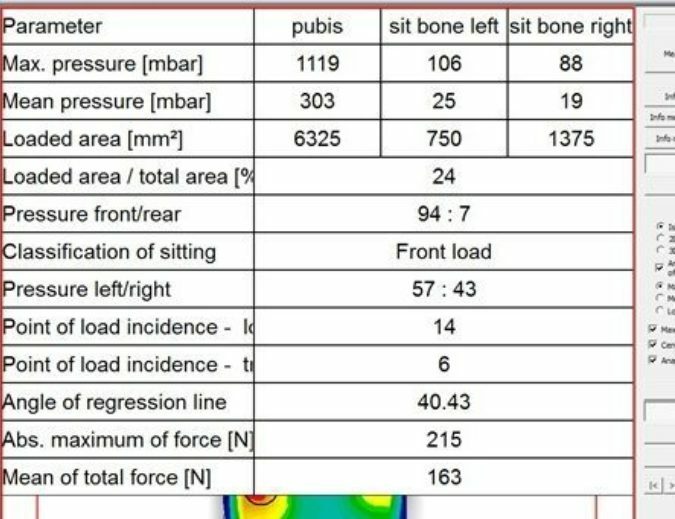 Increased upper-body and saddle-pressure - a partial effect of no headwind - so maybe use another bike on your turbo with a higher bar position? Pedalling technique changes - the challenges of the static trainer are different to the road - make sure you also ride on the road or trail as well. 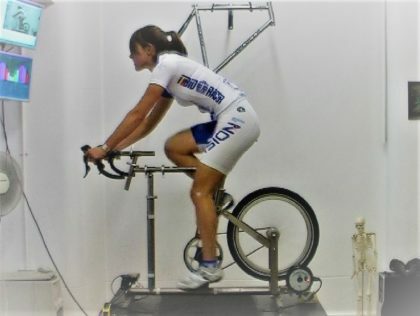 Riders tend to stand less on a static trainer - standing opens hip and targets glut and core contraction - stand up for power! Time spent on a static trainer is time NOT spent in a gym, loading through skeleton - drop one or two of those turbo sessions and get down the gym - vital as we get older and lose muscle bulk and bone-density. 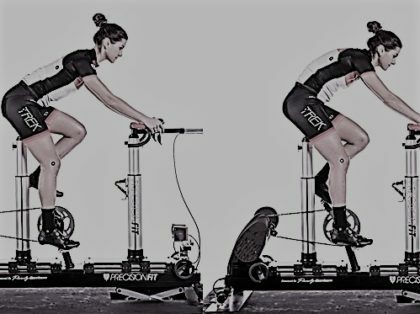 The static bike exaggerates and punishes asymmetry - the bike doesn't move so you have to adapt - make sure your bike fit is optimised - there is nowhere to hide on a static trainer. Saddle pressure - static trainers put more pressure through your saddle area. It is an inescapable fact. 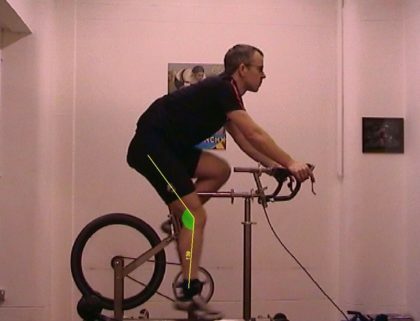 Plus we tend to sit differently on a static trainer (see image below). Saddle choice and position have to be perfectly calibrated. Think also about reducing the duration of your sessions. 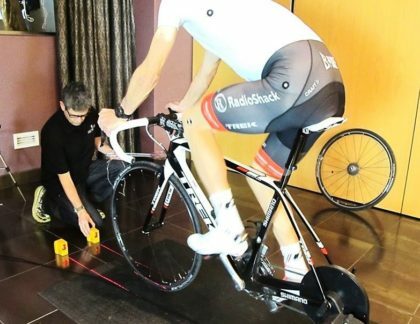 Increasing intensity will change the load bias from saddle to pedals. A good thing. Left image shows a 94% front-loading profile - ouch! "The upstroke is a myth - don't be a peanut"
Yes this old chestnut or should we say Peanut - We have written so many Articles and Journals on this apparently still controversial subject. And yet still the issues persist. 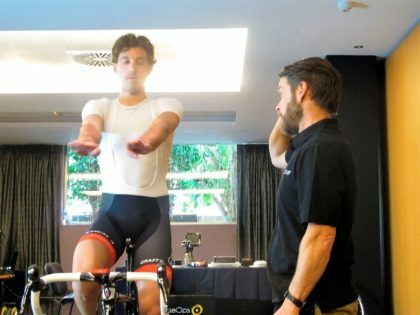 Dr Jeff Broker spoke at our 2012 International Cyclefit Symposium (clip below) and presented the clear data that pedalling is: "a non-circular event". Some companies still seem to advocate pulling up or back or forwards to try and recruit a more circular motion? We simply don't agree and the research seems to back us up. We are bipeds and as such we are powerful in extension, only when we have ground contact. Our evolved function is to spring off the ground utilising our big extensor muscles - gluts (hip-extenders), quads (knee-extenders), calves (ankle plantar-flexors). Pedalling is a lumpy process in the same way that climbing stairs is a lumpy process. But activities both seek to capture our evolved mechanics. Our top tip for pedalling is to keep it simple and only push down. I wrote about our evolved function in an earlier Journal - Humans Did Not Evolve to Ride Bikes! By the way professional riders DON'T pull up. And we have never met a well informed one that bothers to try! We cordially invite any company to present research data to the contrary? 3. Why Are We So Obsessed With Cadence? This should be seen in context with points 1 & 2. (above). It seems to be a general assumption that faster cadence is intrinsically a good thing? In the same way that pulling up and around in a circle is perceived as an inherently virtuous action. We couldn't disagree more. Increasing cadence can be desirable and helpful, but it isn't necessarily so. Fast cadences can lead to increased saddle instability - which in turn can exacerbate saddle pain and sores. Remember stability is as big a component of saddle sores as saddle pressure! 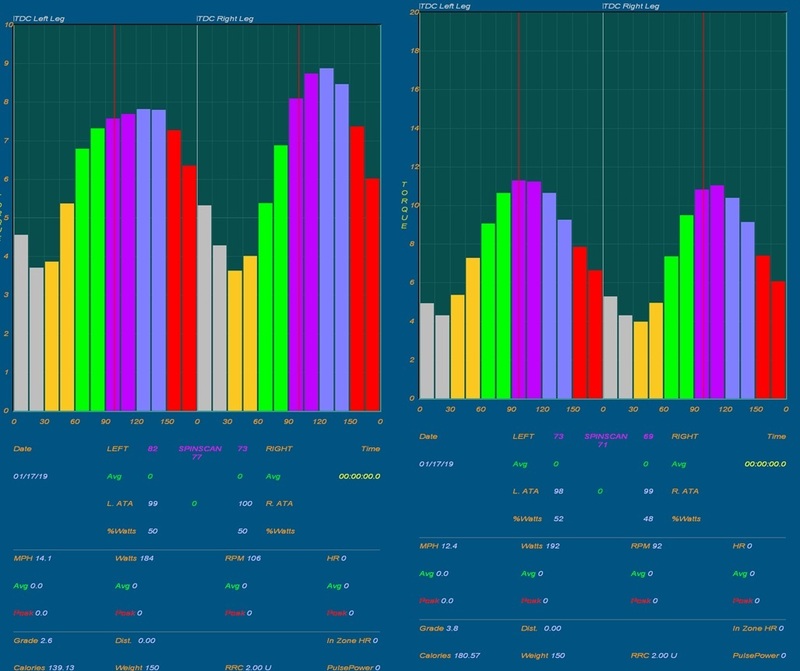 The images below show the Spinscan of a former elite power athlete, who has converted to cycling. The left image shows him at 106 rpm and 184 watts with a marked asymmetry in force application in the both power and recovery phases. The pedal-stroke is confused and dysfunctional even though the left/right output is a symmetrical 50/50%. The right image shows a beautifully controlled pedal-stroke at 92 rpm and 192 watts. The 52/48% L/R imbalance is, to us, less important than the integrity of the pedalling and biomechanics. This case study has a sweet-spot in his pedalling at 92rpm, in the same way that cars have a sweetspot with their engines where they produce maximum torque (and this almost always not at maximum revs). The reason this client preferred a slower cadence is that he had relatively heavy fast-twitch muscle legs - a faster cadence forced the uphill leg to work against the forces of gravity more often. Much better for this client to make much more out of each individual pedal-stroke. This is often the case. The wrong shoe. You can read our recent If The Shoe Fits Journal on this very subject - Never buy shoes online, or at a shop where they don't measure both feet independently - foot-length, foot-width and seated and standing arch-height - this information should be properly recorded. As a very rough guide, you must have at least 1/2 a thumb-width of clearance between the end of your longest toe and the end of the shoe. 60% of new clients we see are in a less than optimal shoe! In truth this has always been an issue - but now we are expecting more of our body's, often later in life, with less time to attribute to body maintenance. We think that you need at least an hour of off the bike conditioning for every five hours on the bike. This ratio needs to pivot more towards off the bike as we age and lose muscle mass and bone density. 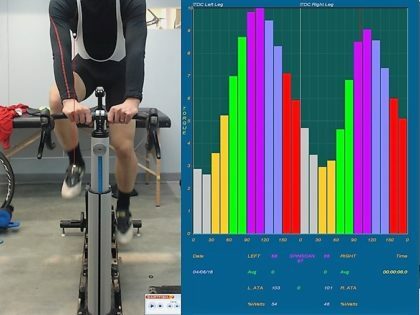 Cyclefit's General Law of Conditioning - That there exists a binary relationship between a rider's general flexibility and conditioning and their ability to sustain an aggressive or aero-position without power-loss, injury or discomfort over time. There are no exceptions. Poor core conditioning - unable to sustain drop to the bars, causing a rotation back through pelvis to alter centre of gravity to unload shoulders/arms/hands. This will negatively affect gluteal and core co-contraction and reduce power, as well as close hip (see picture). If you can't hold a plank for a minute comfortably, we do not think you should have the bars too far below the saddle. 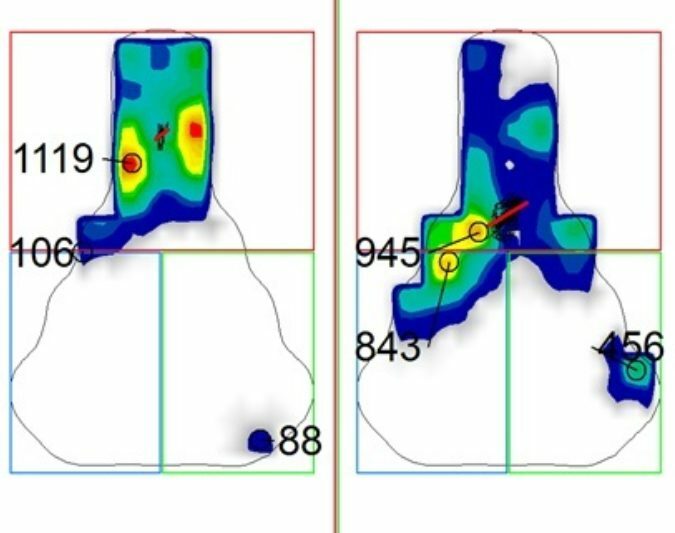 Right image shows a backwards tilt of the pelvis - possibly to offload upper-body, or because of tight hamstrings. Often both. Left image shows a functional posture. "Cyclefit's General Law of Conditioning - That there exists a binary relationship between a rider's general flexibility and conditioning and their ability to sustain an aggressive road, or aero-position without power-loss, injury or discomfort over time"
* Too little hamstring range can pull the pelvis back out of its most powerful position and/or drag up the heel at the bottom of the pedal-stroke. Stability / Strength - cycling does nothing for bone-density, general conditioning or stability. Adding in yoga, circuit-training, pilates or weights will make you stronger an more resilient. Fitting cave-dwellers to a Victorian contraption. Is this the best we can do? Discuss? 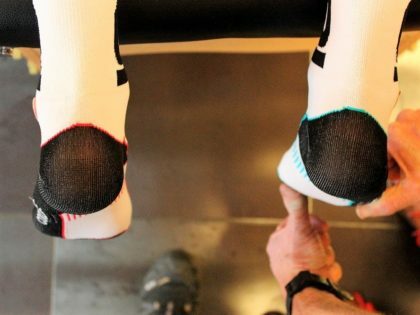 What is the role of Podiatry in cycling?